Don’t give up on your electronic or appliance so fast! There are many places in town that will repair that microwave or stereo for you. Call around to see which business is your best option. Repair your appliances and electronics instead of buying new ones. 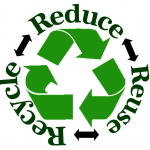 If it’s not repairable or not worth the money, take to Buckman Road Recycling and Transfer Station (BuRRT) to recycle for a small fee or visit the Electronics page to see where else you can recycle it.